Everyone has faced the problem of bringing home a bunch of green bananas and having them become over-ripe in what seems like minutes. 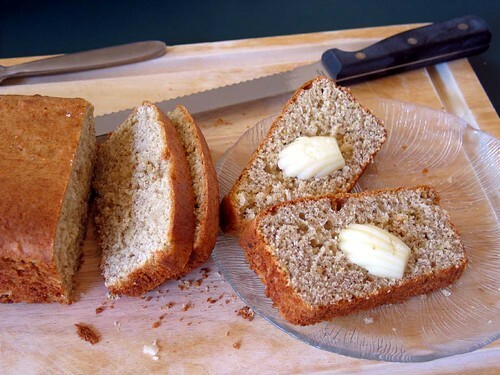 While over ripe bananas are too mushy to carry around like a portable snack, there’s no reason to waste them when with just a little butter, some flour, sugar, spices and an egg you can make delicious quick banana bread. step 1 – Bring on the mixer! 2.) Cream butter, sugar, vanilla, and zest. 3.) 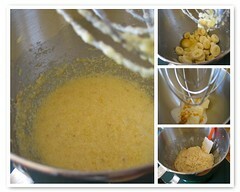 Beat in eggs and banana until mixture is creamy, but not so long that it starts to separate. Scrape the sides back down, as needed before the next step. 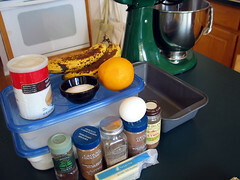 At this point, if you want to add nuts or other fruit, fold in up to 1/2 cup broken nutmeats or dried fruit. 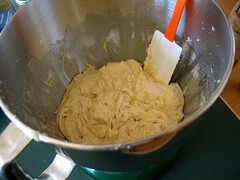 I grease my pan by rubbing the wax paper that held the butter all over the pan, but any greasing method works. You don’t need to flour the pan like you do for traditional breads. 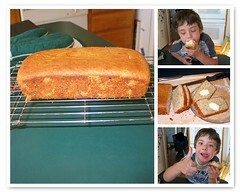 You can if you want, it won’t hurt anything, but quick breads don’t gain the same benefit as yeast breads do. 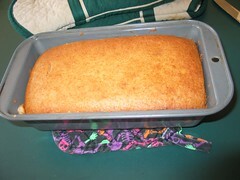 Pop the pan in your preheated oven, and bake for 45 minutes to an hour. When the top is golden and a knife will slide in and out cleanly, it’s done. 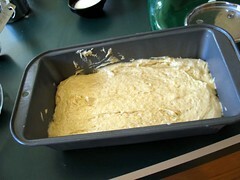 Allow the bread to cool a bit before cutting, it will create a much moister bread, and you won’t burn your fingers. It will also crumble less. Racks are optional, I just happen to have some. Cut with a bread knife. Cut some for everyone else, or you’ll have to hold them off with said bread knife. Spread with butter, or peanut butter, fruit butters, or nothing at all. Not relevant to the article at all… but on another site you said that you’d like to be able to develop black-and-white film, or get it done. Well, the UK company Ilford still does that, and has some US distribution (I think). Google Ilford Film and you’ll find them. Doing it yourself is a bit tricky, but not terribly hard – but you need one specific piece of equipment. I think that Ilford have a “how to” section on their site if you want to go down that road. Hi, DeAnne…I found this site in a round-about way-I was trying to find a recipe to make bourbon jelly, and got sent to a blog site where you said you and your mom made it in the past. Is there any way you could email me your recipe? I’d really appreciate it. BTW, this site is pretty cool! I’ll probably come back here to browse when I have more time. Thanks in advance! I’ll ask her to send it to me and I’ll drop you an email when she does. She’s a fairly busy executive chef, so it may take her some time to get around to typing it up, just fyi.